Hyundai chases VW in Europe after winning in U.S.
BERLIN – Earlier this month, Volkswagen threw a party in New York's Museum of Modern Art to mark a breakthrough year in the U.S. and the highest annual sales in the country since 2002. The celebration proved to be premature. Two days later at the Detroit auto show, Hyundai beat VW's Passat with its Elantra sedan to win the North American Car of the Year award, underlining the company's status as a major competitor to Volkswagen. The automaker and its Kia Motors Corp. affiliate now want to repeat their U.S. success, where they outsell the German company more than three to one, on VW's home turf. "It's very important for Hyundai to be successful" in Europe, said Allan Rushforth, Hyundai's chief operating officer for the region. "Europe is a top priority because it affects how the company is perceived elsewhere." The carmaker, noted for low prices, is targeting Europe as the region's debt crisis makes consumers cost-conscious. Hyundai's mix of value and reliability helped it more than double global deliveries since 2004, beating VW's 60 percent growth, according to researcher IHS Automotive. In 2011, VW sales in the EU and EFTA countries rose 9 percent to 1.68 million units, giving the automaker a 12.4 percent share of the market, according to figures from the Brussels-based industry group ACEA. By comparison, Hyundai sales in the region rose 11.5 percent to 398,129, giving it a 2.9 percent market share. Kia sold 293,960 cars in the same period, a rise of 11.8 percent over 2010 figures, giving it a 2.2 percent share of the market. "Hyundai is one of VW's most serious challengers," said Stefan Bratzel, director of the Center of Automotive Management at the University of Applied Sciences in Bergisch Gladbach, Germany. "The mix of good value, quality and design is a solid basis, and they've been getting more innovative every year." The Hyundai brand plans to increase European sales by about 25 percent to 500,000 cars by 2013, boosted by the i40 sedan and the three-door Veloster sports coupe as well as the i30 compact and i40 wagon, which have been styled specifically for the region, said Rushforth. The company added a third shift at its factory in the Czech Republic last summer to expand production. Sister brand Kia targets 350,000 deliveries this year, a 19 percent gain from 2011, thanks to new versions of the Optima sedan and Cee'd compact, said Paul Philpott, the brand's chief operating officer for Europe. Kia will add a third shift at its factory in Slovakia in the first quarter to boost output of the Sportage SUV and new Cee'd. "There's potential for Kia to become a major mainstream player in Europe," with sales of more than 500,000 vehicles, said Philpott in a Jan. 20 telephone interview from the company's regional headquarters near Frankfurt, adding that "2011 was our take-off year and 2012 will be our acceleration year." VW Chief Executive Officer Martin Winterkorn effectively anointed Hyundai as a top rival after he was shown on video praising the adjustable steering column on an i30 compact during the Frankfurt Motor Show in September. "Nothing rattles," Winterkorn said to his entourage in a video posted on YouTube, which was viewed more than 1.6 million times. "Why can they do it? BMW can't. We can't." The Hyundai i30 starts at 15,490 euros ($19,990) in Germany, 10 percent less than VW's best-selling Golf. 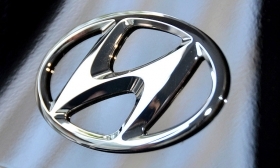 Hyundai plans to keep up the pressure by investing a record 14.1 trillion won ($12.4 billion) to upgrade plants and develop vehicle technology, the company said Dec. 29. VW isn't sitting still. The manufacturer has budgeted 62.4 billion euros to invest in factories and new models over the next five years. CEO Winterkorn told the company's top 2,000 managers at a meeting in Dresden in December that he intends to position Volkswagen to withstand growing competition as it pursues the auto industry's profit and technology lead. "It's become increasingly clear that whoever is at the front has a lot of opponents," Winterkorn said in a speech from the event, the text of which was obtained by Bloomberg. "Our competitors are attacking Volkswagen all over the world." That pressure became clear on Jan. 9, when the Elantra beat the Passat and the Ford Focus in the voting of a jury of 50 automotive journalists from the U.S. and Canada for the independent award of best new car in North America. VW wanted to cap off 2011 with the award after opening a factory in Tennessee and enjoying record sales. "Hyundai offers compelling design at an affordable price-- a win-win for most consumers," Jessica Caldwell, a senior analyst at U.S. auto Web site Edmunds.com. "Brand exposure has long been the problem for Hyundai, but that has certainly eased" with the help of higher sales, ads during the Super Bowl and the sponsorship of the World Cup soccer tournament. Still, buyers on the UK auto Web site Drivethedeal.com paid 82 percent more for VWs, like the 24,175-euro Tiguan SUV, in the fourth quarter compared with Hyundai vehicles, said Richard Sanders, the site's managing director. "People just seem to trust VW more" when buying higher-end cars, said Sanders. "But that's changing. There's nothing wrong with Hyundai product anymore."